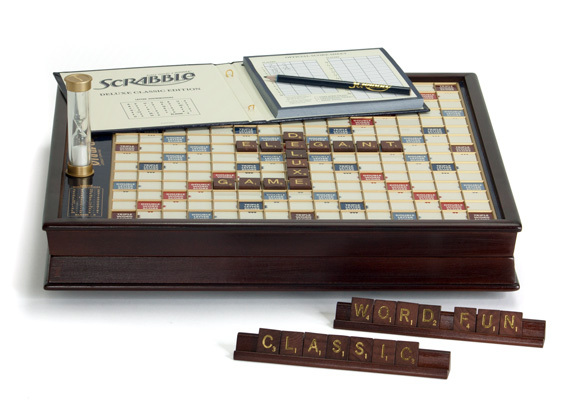 This Wood Scrabble Deluxe Classic Edition is every word-lover's Mecca. If Scrabble is your favorite game, you'll adore this special edition. Why tolerate cardboard when you can arrange your letters on an elegant Scrabble board with a solid wood cabinet with a mahogany finish? The grid is raised to eliminate the stress of sliding letters. The gameboard even rotates, so there is no need to switch places between turns and mess up everyone's words (there's nothing worse than trying to reconstruct a triple-word score masterpiece). And if that weren't enough, this wooden Scrabble also comes with gold-foil stamped solid wood letter tiles, an embroidered pouch, a gold-stamped score book with pencil, and a gold-accented timer, all of which fit in the convenient storage space beneath the gameboard. The Scrabble Deluxe Classic Edition is a perfect gift for Scrabble lovers of all ages because it combines the Scrabble you're used to with the classic appeal of an heirloom game. Measures: 15.75" x 15.75" x 2.5". Availability: This Wooden Scrabble Game takes approximately 1 business day to leave the warehouse plus transit time.